The most successful marketing teams share a common language to describe marketing performance management. This common language serves as the foundation of our Path to Performance. To help your team communicate more effectively, I’m sharing basic definitions in a Marketing Performance glossary. Previously, we defined marketing investments and marketing returns. Once you understand your marketing investments and returns, you can start to build a picture of ROI — your return on investment — and make decisions to improve your ROI down the road. Calculating ROI creates a strategic understanding of marketing that every revenue-driven CMO is looking for. Start with the big picture. What’s your corporate strategy? At the highest level, how will you measure the success of marketing? What are your ROI goals? Top-down perspective: Here we consider ROI overall for your entire organization (i.e. what revenue you earned vs. what you spent overall) or just one or two high-level functional groupings – for example region or business unit. A top-down perspective could also look at strategic groupings such as key global campaign themes, rather than specific activities or campaigns. Advantages: It’s relatively quick and simple, and helps you get a general view of ROI in your marketing organization. Disadvantages: Provides less detail than a campaign-specific perspective. Bottoms-up perspective: Here we look at ROI according to specific campaigns or tactics. Advantages: Lets you know exactly which activities and programs are having revenue impact on a very specific level. Disadvantages: Requires more time and effort to do; expertise can be required in attribution and data modeling; more stakeholders involved; can require more automated processes (for example, linking opportunities with campaigns in a consistent, automated way in your CRM). Which perspective is recommended? 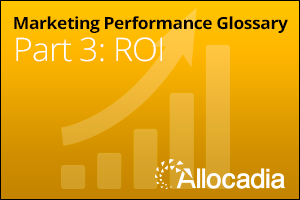 At Allocadia, we recommend starting with a top-down perspective on ROI. We call this “going above attribution.” Some analysts even identify some points of caution when attempting to attribute revenue to individual marketing tactics. Let’s now consider how to set your target ROI. There is no easy answer to what is “good ROI”. One simple way to look at it is that any positive ROI is good ROI. But of course, you want to get more specific than that for a target! You can leverage industry benchmarks in order to set your specific target (as it relates to your industry, company size etc.) or you can use your historical data to look at what’s realistic and then set the bar a little higher for this year. But as a very general rule of thumb, anything above a three times return on investment is probably worth the effort. Planned ROI merges your investment plan with planned results. Once you know your planned spend and planned revenue, it’s straightforward to calculate your planned ROI. We often hear of organizations not including Planned ROI in their marketing planning cycles. They plan how much they will be spending, but don’t always consider the revenue impact of those dollars. Actual ROI is what most marketing leaders are already familiar with. What did you spend? What did you make? Based on those actual numbers, what was your actual ROI? Note: Actual ROI is also the only ROI that most other systems, such as marketing automation and CRM systems, are able to touch upon – and even then, usually with only a static investment figure that is not tied to ERP systems. The “view” you get when looking at your Actual ROI will, of course, depend on how you’ve set up to measure your Target ROI (top-down vs. bottoms-up) as described above. Finally, predictive ROI is your investments forecast merged with your results forecast. Predictive ROI helps organizations understand where they will be tomorrow in terms of ROI. Predictive ROI is calculated by merging your Actual ROI numbers (for example, performance from Q1 and Q2) with future Planned ROI (for example, the ROI you are planning to generate for Q3 and Q4). Blended together, these numbers paint a picture of your average Predicted ROI for the fiscal year. You’ll find more marketing performance term definitions in our glossaries for Investments and Returns, or learn how marketing organizations bring these terms to life in our Path to Performance eBook..